To prepare the cupcakes: Place oven rack in the center position. Preheat oven to 350 degrees. Butter the cupcake molds. In the mixer, cream the butter and sugar together until soft and creamy. Add the egg and vanilla extract and mix until well combined. In a separate bowl, add flour, baking soda and salt. Mix it up and add it to the butter mixture. Pour the buttermilk and continue beating. In a small bowl, combine hot water and cocoa powder and stir into the mix, beat until combined. Pour the batter into the cupcake molds. Bake for 20 to 25 minutes, until the cupcakes rise, are cooked and tanned on top. Transfer to a wire rack and let them cool completely. Using a paring knife, cut a 1-inch piece from the top of each cupcake. Save the cut pieces. Fill each hole with one tablespoon of dulce de leche or cajeta and replace the cut-out pieces. 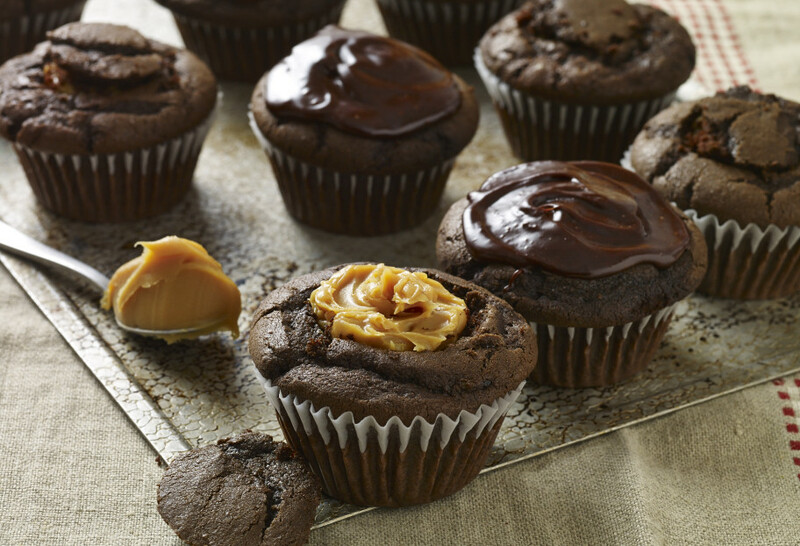 Top the cupcakes with the chocolate ganache. Slowly fold the whipping cream into the melted chocolate. Finish off the ganache by folding in the softened butter and adding sugar until everything is well combined.